The number of home monitoring systems with integrated communication capabilities is expected to grow at a compound annual growth rate (CAGR) of 18 percent until 2016, according to a report published by Berg Insight. The report, titled 'mHealth and Home Monitoring' forecasts, that the number of patients worldwide using remote monitoring solutions will more than double to 4.9 million by the end of 2016, compared to 2.2 million today. "The adoption of out-of-hospital wireless monitoring in healthcare is driven by a wide range of incentives, related to everything from demographics and technology development to new advancements in medical treatment," said Lars Kurkinen and Johan Fagerberg, analysts at Berg Insight. "There are, however, a number of barriers, including resistance to change among healthcare organizations and clinicians, misaligned incentive structures and the financing of wireless solutions by what is at large an underfunded healthcare sector." The report indicates that the most common conditions that can be monitored by mHealth systems are chronic diseases, from which over 200 million patients in the EU and the US suffer. These diseases include cardiac arrhythmia, hypertension, ischemic diseases, sleep apnea, diabetes, hyperlipidemia, asthma and chronic obstructive pulmonary disease (COPD). Berg analysts said that applying information and communication technologies in the healthcare industry can lead to decreased costs, more efficient care delivery and improved sustainability of the healthcare system. 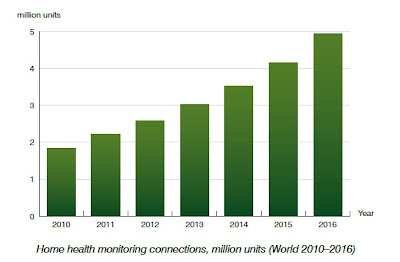 The report, which names Aerotel Medical Systems as one of the leading providers of mHealth solutions, shows that the number of devices that have integrated cellular connectivity rose to 570,000 from only 420,000 in 2010. The number is expected to surge at a CAGR of 34.6% to 2.47 million in 2016. Several companies have developed integrated solutions for monitoring multiple chronic diseases and other conditions. The six leading providers of integrated telehealth systems include the major technology and electronics companies Bosch, Honeywell, Philips and Bayer, as well as the small specialist telehealth companies Cardiocom, and Numera.